Imagine dipping your hands into a bin full of marbles. The rainbow colors striking your eyes as your hands rake smoothly through the marbles discovering new small objects, and your nose smells the soothing lavender oil covering the marbles. Sounds relaxing and stimulating, right? All of these senses (& some others!) are activated during sensory bin play. Sensory bins are hands-on tools for children to explore their world through senses. Sensory plan may calm, focus, and engage a child. Sensory exploration: Sensory bins may incorporate a variety of senses: touch, sight, sounds, taste, and smell for children to learn and explore. Play skills: Sensory bins are a great opportunity for children to learn cooperative play. Bins may be used in class, group therapy sessions, or at-home with friends to encourage socialization and conversation. Children can learn how to share, communicate, and participate in exploratory play with others. Language development: Sensory bins may be filled with a variety of items to increase language development. The bins can provide opportunities to discuss hidden objects. Fine motor skills: Children can improve fine motor skills through scooping, grasping, stirring, and pouring with a variety of tools. Tools may include shovels, spoons, tongs, measuring cups, etc. Cognitive task: Create a learning experience with a sensory box filled with objects. Encourage your children to sort and categorize items by color, shape, and size. Play I-spy with the sensory bin and have your children search for hidden items. Create a counting game by counting the amount of items in the bin. Choose a bin. Clear storage containers work the best so children can see inside. Choose the filler: Our favorites include rice, water beads, water, sand, beans, cereal, marbles, shredded paper, popcorn kernels, pasta, Easter grass, and birdseeds. Add tools. Small shovel, spoon, tongs, measuring cups, cookie cutters, and/or small rake. Add objects. Create themes for bins with small animal figurines, magnetic alphabet letters, magnet numbers, colorful buttons, and toy cars. Look around the house for small objects to encourage naming and exploration of household items such as rubber bands, paper clip, buttons, coins, etc. Check out Little Bins for Little Hands for great examples of sensory bins. Have fun creating unique sensory bins your children will love! Brittany. 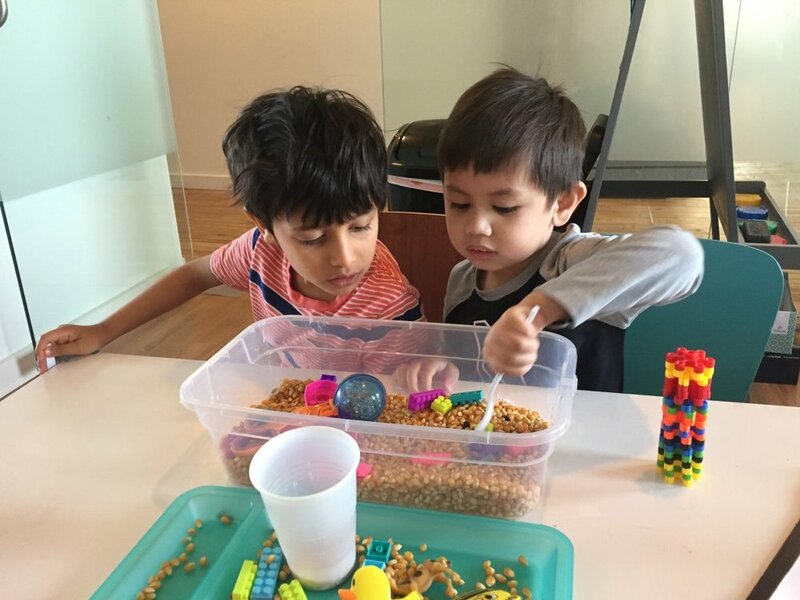 “Sensory Bin 101- What Is Sensory Play and Sensory Bins.” Love Play Learn, 23 Feb. 2017, loveplayandlearn.com/sensory-bin-101/. littlebins. “About Sensory Bins and Everything You Need To Know To Make One.” Little Bins for Little Hands, 5 Sept. 2017, littlebinsforlittlehands.com/all-about-sensory-bins-5-things-need-know/. Heffron, Claire. “Simple (but Effective) Upgrades for Sensory Tables and Sensory Bins.” The Inspired Treehouse, 20 Oct. 2017, theinspiredtreehouse.com/simple-effective-upgrades-sensory-tables-sensory-bins/.